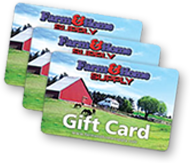 Supply your farm, ranch or jobsite with all of the tools and materials you need to get a job done with the help of Farm & Home Supply. We carry everything you need to keep your business running smoothly in our farm and agriculture section. Fence off sections of your land for livestock or other uses with our fencing, gates and panels. Choose from cattle fence, horse fence and goat and sheep fence. We also sell barbed wire and electric fence. Make sure that all of your crops get an even coat of pesticide and your weeds get a good coat of herbicide with one of our sprayers as well as chemical sprayer parts and pumps. If you drive your tractor down a public road, you'll need a slow-moving-vehicle sign and other tractor accessories. Attach a safety light to your tractor for low-light driving, as well. Chains, pins and clamps are always useful around the farm. We also carry water pumps, water handling products and hydraulics. Keep your equipment working correctly with oils, lube and chemicals. You can also keep your land lush with seed and field supplies. Some other farming products that we carry include CB radios, hitch pins, seed moisture testers and soil pH testers. You can also use our three-point equipment when it comes time to bale hay or move bales of hay. Our farm supplies and equipment are manufactured by high-quality agricultural brands. Some of these include Applegate, Gallagher, OK Brand Oklahoma Steel & Wire, Parmak, Tytan, Zareba, Worksaver, SMV Industries, Fimco, Double HH, Chapin, Delavan, Harvest King, Pioneer, Wayne, Water Worker, Dickey-John, Timewell Tile, Lucas Oil, Van Sickle, Majic, Martin Lubricants, Shell Rotella, WD-40 and Durex. Whatever you need for your farm, home or machinery, you can count on Farm & Home Supply for the best selection and the best prices.